Indigestion can include feelings of bloating, gas, nausea, heartburn and other gastric distress after eating certain foods. 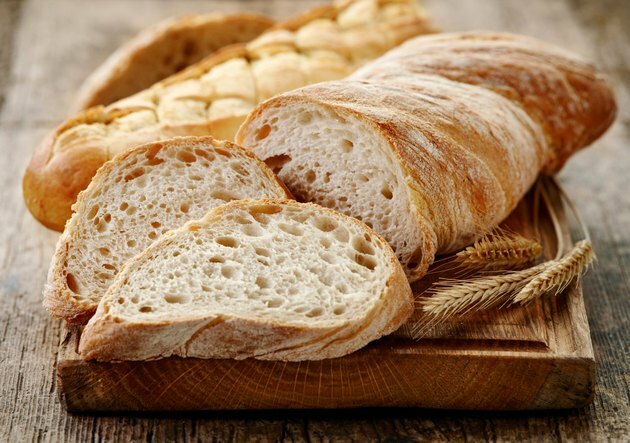 While a slice of yeast bread is often considered gentle on the stomach, the major ingredients in bread can cause indigestion in people who have food allergies, digestive diseases or certain food intolerances. See your doctor immediately if indigestion symptoms are accompanied by shortness of breath, severe pain or vomiting. Wheat is one of the eight most common food allergens, according to the U.S. Food and Drug Administration (FDA). When people with wheat allergies eat foods containing wheat, like most yeast breads, they may experience contact allergic responses like hives or swelling of the mouth, or systemic responses including abdominal cramps, vomiting and diarrhea. A severe allergic response to a food allergen can include life-threatening anaphylactic shock. Under the Food Allergen Labeling and Consumer Protection Act of 2004, all foods containing wheat and the other seven most common food allergens must be prominently labeled, according to the FDA. People with Celiac disease are intolerant of gluten, the substance in wheat flour that gives yeasted bread its raised, airy structure. This genetic disorder causes the body to set off an autoimmune response when the person eats gluten, according to the University of Maryland Medical Center. This response not only treats the gluten as a hostile invader, but also attacks the inner wall of the small intestines. Symptoms can include a range of digestion problems including stomach pain, bloating and diarrhea. Yeasts are single-cell fungi. Individuals with allergies to mold -- which are multi-cell fungi -- may also experience allergic symptoms including indigestion when consuming foods containing yeast, according to the University of Maryland Medical Center. Additionally, molds that grow on bread or on wheat and wheat flour may be consumed while eating bread, triggering additional allergic responses. People with mold allergies should particularly avoid high-yeast sour breads like pumpernickel and sourdough, according to the Cleveland Clinic. Breads made from whole grains such as whole wheat may be high in dietary fiber. Some breads also contain high-fiber additions like wheat bran, oat bran or flax seed. Dietary fiber can be beneficial for health and digestion, according to the Colorado State University Extension website. People unaccustomed to eating significant amounts of dietary fiber may experience gas, bloating and diarrhea when they first eat high-fiber foods. You can increase the amount of whole grain bread and other high-fiber foods slowly to minimize gastric distress until your digestive system adapts to a healthy high-fiber diet. Why Do You Have Stomach Pain After Eating Bread?